Soup is a delicious and tasty light meal or starter any day of the week. Instead of reaching for the tin opener, you can make your favourite soup just how you like it, quickly and easily, in the Russell Hobbs Soup and Blend. The secret to making both warming soups and chilled smoothies lies in a specially designed jug blender with heating element. At breakfast time you can switch it on to create delicious nutritious smoothies. You can then use the same unit to make tasty, piping hot soup full of natural ingredients. 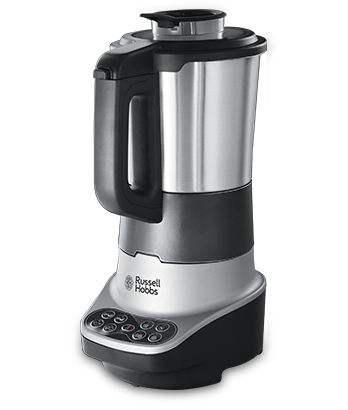 The Russell Hobbs Soup Maker has a choice of 8 programmes for filling Chunky Soup, smooth Creamy Soup, Sauce, Boil/Steam, Smoothie, Blend, Ice Crush and Pulse - making it useful for a host of hot or cold recipes require blending. It’s easy to use too. Simply select the function, press the button and go. It has two automatic functions so that you can blend hot or cold ingredients for a range of recipes from breakfast to dinner. 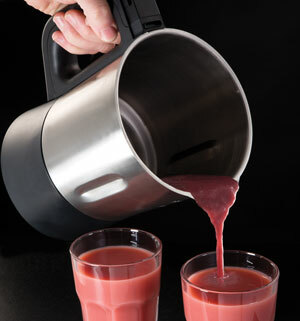 The stylish jug can blend 1.75 litres of cold ingredients or 1.4 litres of hot soup. Make jug fulls of smoothies and iced fruit cocktails for all the family at breakfast or for a refreshing drink at anytime. Because it’s big enough to make 4 servings, all the family can enjoy it.